Which usability changes make the biggest difference? 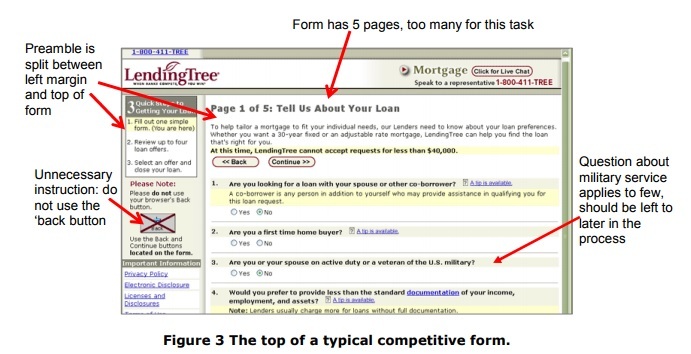 Invited by LoanBright to review their forms, we were surprised by some of the results. Among the changes we tested – layout, wording of questions, addition of extra pages – the only one to make a significant difference was re-working the introduction to the form. In this case study, first delivered to the Usability Professionals’ Association Conference in Minneapolis, US, LoanBright’s Christopher Minott and I describe the process and results. LoanBright is a web business that finds customers for mortgage providers and offers a range of tools to help mortgage providers manage their sales process. 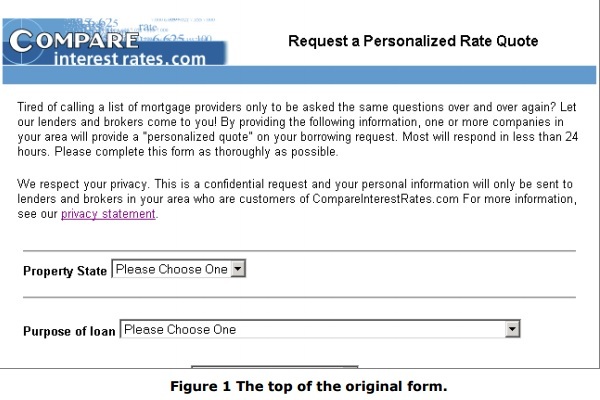 – the mortgage rate quote finder selects the best four providers and displays them to the user. 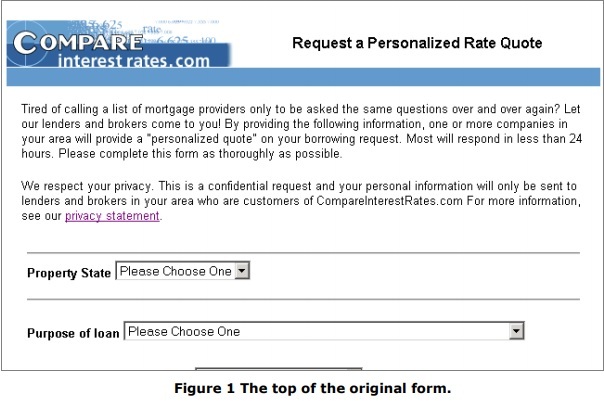 The business is funded by the fees paid by the mortgage providers for the leads that they receive. The marketplace is especially competitive. Respectable web businesses are fighting it out with traditional financial institutions that are moving to the web, and there is also a nasty presence of spammers. A key business measurement is the ‘conversion rate’: the percentage of users who complete a form (to the ‘submit’ or ‘send’ button) compared to those who arrive at it. It is the inverse of ‘drop out rate’. 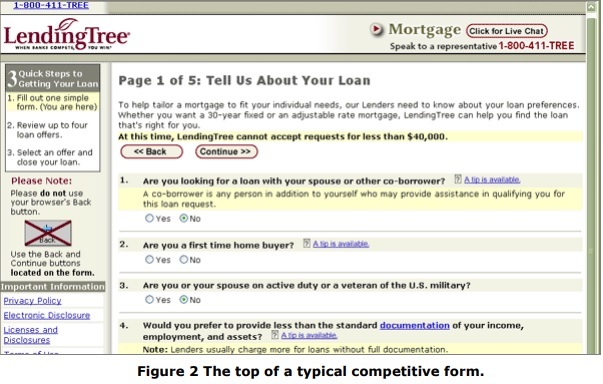 Loanbright’s form, shown in Figure 1 below, had done good service for several years but the feeling within Loanbright was that it was looking old-fashioned and might be inefficient. (They have a variety of forms with minor variations, but this one is representative). Also, some competitors used photos of people and/or property and they wondered whether these might create a more attractive or engaging appearance, resulting in a higher conversion rate. Because there were some differences of opinion about which changes would have the greatest effect, Loanbright decided to start with an expert inspection from Caroline Jarrett of Effortmark Ltd.
She reviewed their form, and those of seven competitors. This was feasible because all of these forms are fairly short, typically three or four screenfuls of questions. Figure 2 shows a typical competitor’s form. This was an ordinary expert review, and is included here as background for the second phase. For example, Figure 3 points out a few of the faults of one of the competitive forms. 2. nothing to indicate that the organisation behind the form is a respectable business (no ‘about us’ or ‘contact us’). 5. some other minor changes to wording. Loanbright decided to address point 4 immediately, so we have no data on whether they are significant changes or merely minor good ideas. Point 6 was left aside for the future. variants on the live service. As we had complete control over how forms were served to users, we elected to create many different versions of the form with a variety of changes made in each version. 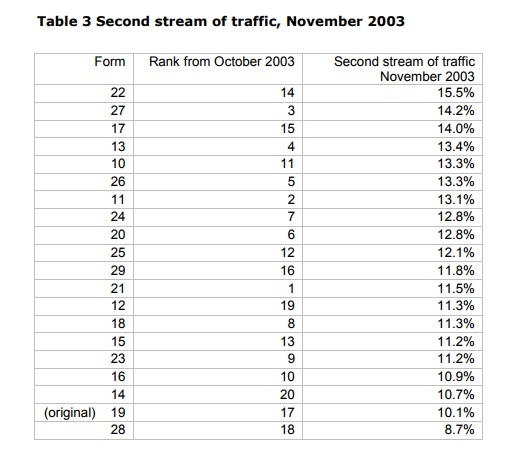 These forms were served to a randomised, balanced stream of traffic so that each version was seen by directly comparable audiences. There was no observation of users or indeed any contact with them other than their interaction with whatever form was served. We therefore have no qualitative data about why one variant worked better, or worse, than another variant. Figure 4 shows three of the variants tested. to include some forms with a photo and the old preamble. As the testing had already started, we decided to continue with the variants we had already prepared rather than adding any extra variants. A preliminary test with a very poor stream of traffic (typical conversion rate around 1%) showed that the variants were comparable or better than the original form. LoanBright therefore decided to expose the variants to a better stream of traffic, this time with anticipated conversion rate around 5%. 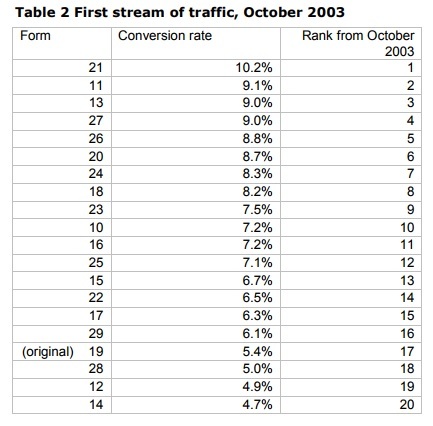 During the month of October 2003, the average conversion rate of all the variants was 7.3%, adding 2.5% to the conversion rates and therefore 33% better. This was encouraging and in itself justified the work of producing the variants. 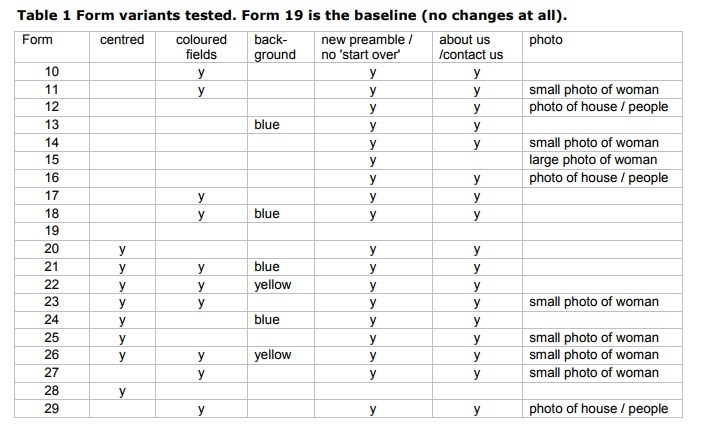 However, as Table 2 shows, we had difficulty working out which changes gave the best results. Three of the new variants were actually slightly worse than the original. It was also hard to map rank in Table 2 to any of the groups of changes. As the average improvement was good, LoanBright decided to try the variants on a better stream of traffic (typical conversion rates around 10%) during November to see whether the improvement was maintained. We were pleased that the average conversion rate again improved by 2.5%. Table 3 was also difficult to interpret, as forms that had previously done well dropped in the rankings and others rose. We decided that the next step needed to be some statistical analysis. 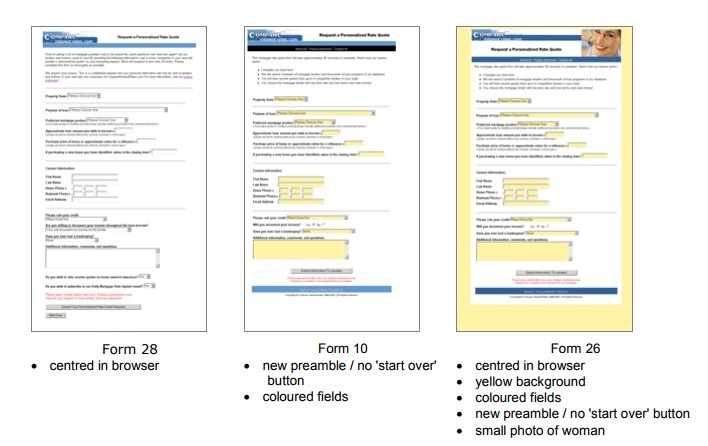 We used Michael Hughes’s Usability Data Analyzer (1) to compare forms with a specific change to the others without that change. The first analysis was to compare variants with the original preamble (references 19 and 28) with variants with the new preamble (all the others). Again, in hindsight it was a pity that we only had two of one type and 18 of the others. Both tests, October and November, showed a significant difference (p= 0.047 October, p=0.006 November) between the conversion rates for the variants with the original preamble and with the new preamble. 4. Adding a blue background to the window. tinkering with a design that is reasonably tidy and organised in the first place is unlikely to make a major difference to the success of a form. We also speculate that offering variants of the same form with minor visual changes may in itself increase conversion rates, simply because potential users are being presented with something a little different each time. 1. Michael Hughes “The Usability Data Analyzer” available for download at http://www.mindspring.com/~mikehughes.